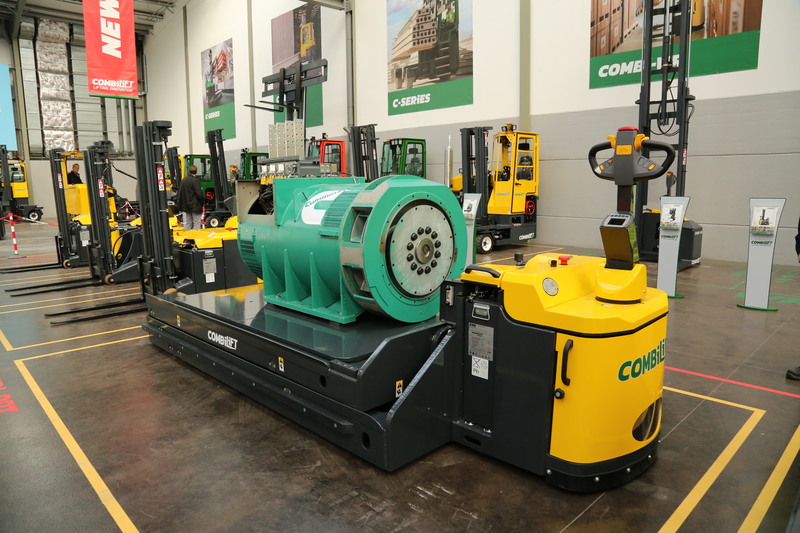 Powerful, economical and thoughtfully-designed, Combilift’s Powered Pallet Truck is a highly versatile option, suitable for small to medium-sized warehouses and production facilities, with a lifting capacity up to 16,000 kg. Packed with clever features, the Combi-PPT offers both stand-on and walk behind operation with an automatic folding platform that allows the truck to operate in the smallest spaces. Our patented rotating tiller arm offers a responsive driving experience and can be turned to the left or right which allows the operator to stand to one side, providing full visibility of the load and forks while maintaining full steering control. This feature eliminates the risk of the operator being trapped or crushed while allowing the Combi-PPT to operate in very narrow aisles. All-wheel drive allows the Combi-PPT to glide effortlessly around the warehouse, negotiating obstacles with ease. Unrivalled energy efficiency means you get maximum output from every charge, while quick-change technology enables you to quickly insert a fresh battery and carry on working effectively.